So, that was a doozy of an episode, now wasn’t it? Full disclosure, I’m not EXACTLY sure everything I was supposed to take from the hour, which would be Nic Pizzolatto’s master plan, most likely. There was so much thrown at the audience in relation more to the case, but also to the characters themselves, it was nearly impossible to sift through it all. HOWEVER, last week I told you two things: Harris James was important, and the church was going to play a role, precisely because it was entirely ignored seven days ago. Boy did it ever, at least as it relates to Tom Purcell, who if he wasn’t “outed,” was certainly accused of something that assuredly wasn’t entirely accepted in deep south Arkansas. Could it explain his violent outbursts, his alcoholism, his hair-trigger, or the fact he seemed to have virtually zero friends of any type in his life that would vouch for even the most minimal portion of his character. No one knew him, or those that did also lived secret lives. That said, the end of the episode was illuminating, both literally and figuratively. The princess of the pink walls, which began as a drawing in Julie Purcell’s bedroom, morphed into a claim she made to others about herself, and continually found its way back into the True Detective proceedings, came to an entirely new level at the tail end of “Hunters in the Dark,” which was a perfect title as Tom flipped on the light switch and we all saw enough to know we need to see more in that Hoyt mansion upstairs bedroom. Here’s the thing. Atmosphere matters in television and pop culture of all types, and no question the way in which Nic Pizzolatto and Daniel Sackheim, who directed the episode, combined to lay out this moment made it arguably the most effective visual of the six hours we’ve experienced thus far. We have absolutely no idea what Tom Purcell saw when the lights came on, but we know it’s a pink room with pink walls, and the actual color itself was off-putting, because it vaguely illuminated Tom’s face just before Harris James stalked up behind him. Dan O’Brien is the scumbag of all scumbags, but at least it appears we found out during the episode that no adult was spying on children changing in that house. Instead, it was Will and Julie passing notes between the bedrooms, which makes sense in a broken home where the parents were often substance-fueled and loudly arguing. It explains the very basic one-line responses Wayne Hays found during the initial 1980 search of the residence as well. It feels now like we can entirely dismiss any “supernatural” motions as it relates to the season, just as we did in Season 1. Whatever happened, it’s going to come to a logical conclusion, even if it’s almost a lock to be impossibly difficult to hear. The story is already dark, growing bleaker by the week it seems, but the ending is going to knock us flat, whether it satisfies us or not. Nic goes hard boiled with his fiction and his storytelling, and this time he’s hit the tone right. This was without a doubt the toughest hour of the season to watch, taking us to strange places and casting aspersions at the seediest individuals we’ve met thus far. “Hunters in the Dark” also applies beautifully to Wayne Hays’ entire life, and especially the confused man we meet in 2015 that desperately wants to solve this crime while also using it to piece together snippets of his life that have seemingly disappeared into thin air. One observation this week that I didn’t mention in any respect in the previous review. The working theory amongst most fans right now is that Amelia is the murderer. I believe there’s a good chance that opinion will change following tonight’s episode, BUT if it doesn’t…I can also make a case why it shouldn’t. Last week, Wayne Hays garnered new information while reading his deceased ex’s book and then lamented to himself, “Ohhhhh, maybe I should’ve read this a long time ago.” We see Roland West page through Wayne’s copy, which is now dogeared and filled with notes, all of them sending his former partner into new places relative to the disappearance of Julie Purcell and the murder of her brother. So, if you want to stick with the idea that it’s Amelia, it would make all the sense in the world for him to figure out the crime when he actually FINISHES her famous written work for the first time, only to discover it was her all along. He has gone through life with blinders on. His version of Birdbox cost him his marriage, cost him a relationship with his daughter, cost him advancement in his professional life, and what if it turns out the key to solving the case was to stop for a moment and accept the fact that the answers were all around him, not inside of him. He takes this case so personally, to the extent it’s as if he can’t even deal with the possibility someone else might be able to solve it. HE NEEDS TO BE THE GUY. That’s been his downfall for 35 years. There are flashes of the human being we met at the beginning of the series as he tries to give fatherly wisdom to his son, who is amidst an extramarital affair, but has no interest in leaving his marriage. He tells Henry that holding back is unacceptable, that he’s learned that what matters are the people in one’s life. You cannot be stingy from the people you love. In this sequence, we hear in Wayne’s voice a man that regrets some of the choices that decimated his family. He sees a vision of Amelia and Henry working outside the home in a small garden, and notice how quickly that vision disappears. It’s fleeting to another level because, well, it was rare, and almost every memory in Hays’ life is clouded by the obsession over the Purcell case that haunts him and leaves him as a hunter in the dark (sometimes literally as he see him comb through the now vandalized remains of the home, cobwebs all around), unsure what happened, unsure who to trust (including himself), and drawn into a world of nothingness that would make Nietzsche blush. I kind of want to gloss over Uncle Dan, but I know we can’t. He’s now a strung-out addict and decides the best move for him is to act as if he knows more than he actually does about the situation and attempt to obtain 7K from two detectives that hate his guts. I can’t say I felt a particular brand of sympathy for him when Tom showed up outside his hotel room and put a revolver to his chin. Another guy I feel zero sympathy for is Gerald Kindt, who railroaded Brett Woodard as the perpetrator. Actually, it would be more accurate to say he WOULD have, had the poor guy not set up his own suicide in that war zone that became his property last week. The guy died. Case closed. What’s the defense in that instance? There isn’t one. This week, you heard Kindt clearly say something I’ve written about in the past. The scariest things in life are the ones that remain unresolved, whether it’s a crime, a conflict, a loss, or anything else unexplained that lingers. Thus, his idea that the community needs to heal is the best possible reason an opportunist could use to rationalize a half-hearted investigation designed to do nothing but close the book on a case. It’s all about political power and growth, expediency to lead to a better and more advantageous seat at the table. One interesting return is our one-eyed friend from the trailer park a few weeks ago that nearly set off the race riot between the locals and Roland West (and Hays, but mainly West due to him being white). He’s stirring trouble again, this time verbally insinuating Amelia is the same thing her own husband told her she was, someone who was “milking their pain” with no new answers. She’s writing about the new investigation in 1990, fingerprint evidence in particular, but there’s nothing truly unwrapped left under her Christmas tree. He basically says it’s a cash grab, and though it may well be, Amelia has always had an unhealthy tie to the case. Without question, however, it has brought her financial gain and professional adulation…beats teaching elementary school for a living, doesn’t it? Though Tom is accused, probably with truth, of being attracted to men, Harris James is the one that makes the creepiest comment of all when he tells Wayne he has a good body after the ill-timed donut joke in the office. 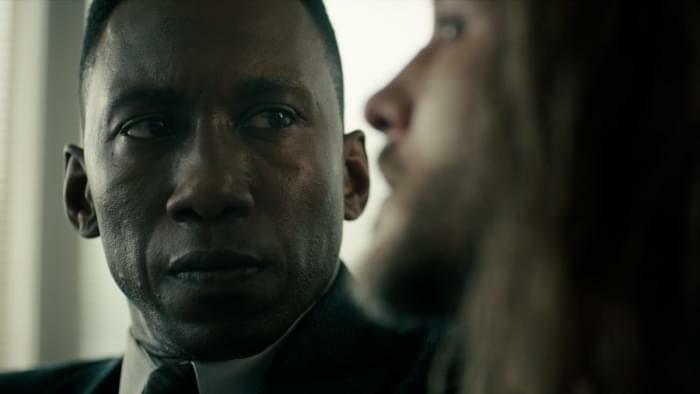 This angle wasn’t where I expected Pizzolatto to take True Detective this season, but that’s precisely why it fits. This is what this dude does, folks. It’s what he trades in. It’s why I’ve given NO prediction for the whodunit, because it’s futile, even if we have a good sense of the small group potentially involved. I’d rather just analyze after the fact than feel stupid for talking too quickly. I know theories make the world go round, but while I’m plenty happy to go down the Westworld rabbit hole in that way, here I’m just watching with the rest of the planet. Earlier this week, The Ringer published an article asserting Stephen Dorff has “quietly” become the best part of the series. I’m nearly ready to agree with the author of that piece, and if I’m not all the way there yet, it’s become 1 and 1A with Dorff and Mahershala Ali. This is as good as Dorff has ever been, and his performance grows in nuance by the week, just as Ali’s does. Those two are pure dynamite on screen together, and the comparisons to Woody and Matthew are entirely apt, to say the least. The acting on this show and the chemistry between the leads has been incredibly effective. What is Harris James doing in that house after Tom broke in? What’s his real role here? And, is that going to turn out to be the final time we see Tom Purcell in human form, rather than as a pile of bones in a drained quarry? Something truly nefarious has gone here. Remember the “secret friends” in the woods we’ve heard about for weeks. I posited last week a vague question as to whether or not they were Julie’s protectors, perhaps Will’s as well, attempting to rescue her from a home where she was never safe. Take that question a little further this week. What if these people are operating as protectors, when in fact they are flat out abductors, potentially with some level of mental derangement, or, God forbid, something sexual in nature. Lest we forget, this story ain’t for the weak of heart. It never was. It never will be. It was SUPER dark tonight…and there are two weeks to go, with tons of questions that have to be answered and deep, unclean pathways to traverse. I am extremely curious to find out what goes down in 2015…and perhaps what WENT down in 1990. Harris James as the victim of a Hays-West incident could be in the offing. There’s also a wild theory asserting Wayne’s memory loss began after something that smashed him into a thousand pieces, something we haven’t seen yet. Wayne Hays murdered his ex-wife after the investigation was reopened. And whatever threads of normalcy were left in him exited stage left in that moment. But Nic Pizzolatto has no problem taking it to the lowest level imaginable to spin his hard-boiled crime yarn. If you want one final example, recall the conversation Amelia had with Julie’s former roommate in the home. That girl was destroyed. “You want to write a book? Write about what happens to kids out here. What happens to girls?” No further exposition is needed, but it was impossible not to see the evil surrounding that adolescent. Amelia didn’t even know how to react. I know how I reacted as a viewer. My head dropped, and I groaned without sound. As for the crime, we still have to see. The cliffhanger this week was tremendous. What are your thoughts. Who do you have pegged for this? Or, like me, are you just not quite ready to push a theory yet. I’m @JMartZone. Sometimes I go by @JMartZoneJuly…like summertime.